Sweet sausage, onions and peppers are a classic combination, especially served on a crusty roll with robust mustard. They evoke memories of an afternoon at the ballpark, a backyard picnic or a casual meal with friends and family. Cooking the ingredients the day before you serve them is a timesaver -- the meal doesn’t require a lot of preparation or attention while it’s cooking, so you can prepare the ingredients while you’re cooking dinner and reheat the next day. Prick the sausage casing two or three times with a sharp knife or a fork to prevent the casing from splitting while the sausage is cooking. Add a little oil to a skillet, or use cooking spray. Some of the fat will render as you cook the sausages, but a little oil at the beginning will keep them from sticking to the pan. 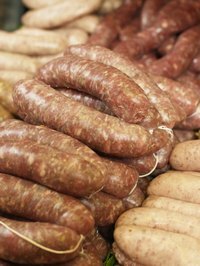 If you prefer a healthier method, poach or steam the sausages in about a half-inch of water. The trickiest part of cooking sausages is making sure they cook through, so after you’ve browned them, cover the pan and lower the heat. Test for done-ness with a meat thermometer -- pork sausage is done when it reaches an internal temperature of 145 degrees. Use a sharp paring knife to cut off the stem ends of the peppers. Slice the pepper in half, remove the seeds and white membrane and then slice the pepper into same-sized pieces. Remove the root end and the skin of the onion and slice it into thin rings. If the onion is hard to handle while you’re cutting it, slice off a small section on one side to create a flat surface on the onion. Since the vegetables soften when they cook, the shapes aren’t that important. What is important is making them all about the same size, so they cook evenly. Saute the onions and peppers in a little oil, or use the steaming method. Drain the sausages on paper towels, let them cool slightly, and store them in the refrigerator in a resealable plastic bag. Squeeze the air out before you seal the bag. Drain the vegetables on paper towels, and store them in the refrigerator in a plastic bag or plastic container with a lid. Reheat the sausage, onions and peppers in a roasting pan in a slow oven the next day, or warm them separately in the microwave oven. If you use the microwave method to reheat the sausage, lay them on a layer of paper towels and place a paper towel on top of them to catch splatters. Warm crusty rolls in the oven or toaster oven until they’re lightly browned, spread the rolls with mustard and place one sausage and a generous spoonful of vegetables in each roll. If your kids don’t like onion but do like peppers, or vice versa, cook the onions and peppers separately. The onions and peppers can be cooked in the same pan with the sausage, but, depending on the intensity of the flavors in the sausage, they may lose some of their distinct flavors in the process. Instead of sandwiches, remove the casing from the sausage, break up the meat and spread it on a pre-made pizza crust. Top with the peppers and onions and some cheese and bake until it’s warmed through.